At Sales Trailers we pride ourselves on the fact that we lead the way not only in style and design but also on quality. We guarantee that all of the products we use meet the highest manufacturing standards and yet we always strive to make sure that we continue to offer exceptional value to our loyal customer base. With over 40 years of experience on the side of our design and manufacturing teams, Sales Trailers is much more than just our impeccable high standards of customer service and quality product guarantee. Dedicated commitment to our craft has seen us achieve such longevity within the industry, and this in turn has seen us firmly establish ourselves as the leaders in our field. As you can imagine from a company with such a proud history, there is nothing we haven’t seen in all of our years and we are able to provide custom trailers to suit every condition Australia has to offer. We specialise in Australian built trailers with a particular emphasis on boat trailers, including both standard and custom built options. 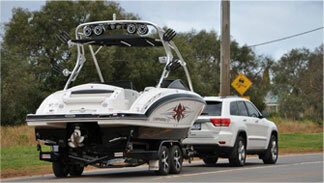 We stock a wide range of trailers that meet all needs, right up from your typical tinny to inboard ski boats. Jet Ski and box trailers are also one of our fortes, and with our strong emphasis on innovation we continually set the standard that our competitors within the industry seek to follow, but never match. With a trailer from Sails Trailers you know you can rest assured that you are receiving a top quality Australian product at a fair and competitive price. 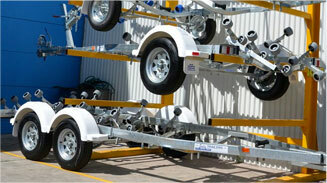 Sales Trailers are an RTA Certified Trailer Inspection Station. All of our trailers comply with certified RTA standards, meaning that we are able to register our customer’s trailers in their name upon purchase and pickup. Customers are initially issued with an interim registration label and number plate that is ultimately replaced with a registration sticker which will be mailed out after a short period of time.